↑ "PM reveals inner cowboy". The Sydney Morning Herald. 19 September 2008. Retrieved 19 September 2008. ↑ Duff, Eamonn; Walsh, Kerry-Anne (11 March 2007). "A disputed eviction and a tale of family honour". The Sun-Herald. Retrieved 11 March 2007. ↑ Marriner, Cosima (9 December 2006). "The lonely road to the top". The Sydney Morning Herald. p. 33. Retrieved 27 May 2007. 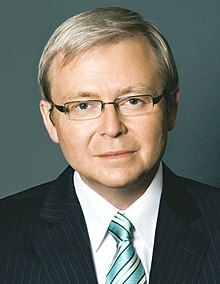 ↑ "Abott new PM, Rudd stands down as leader". SBS. ↑ Thérèse Rein. National Archives of Australia. Retrieved 17 November 2012.